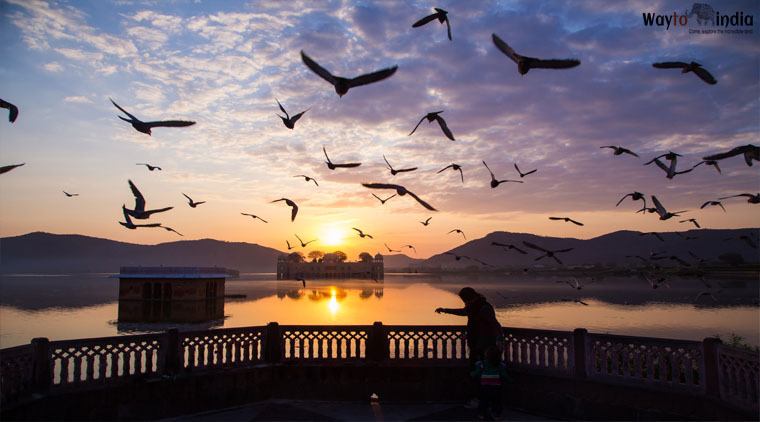 This Rajasthan tour package 10 days itinerary unveils one of the most intriguing heritage trails of the world as it follows the footprints of the erstwhile royals. The desert state boasts of architecture that was simply ahead of its time and art that would impress generations. There are forts with unsurpassable defence mechanisms, palaces with elegance carved in stones, havelis that are no less than the open art galleries and temples where divinity willingly resides. Then, there are the contrasting landscapes of golden dunes and sparkling lakes that make this package absolutely fascinating. But, that’s not all! The itinerary lets you discover another treasure trove of royal heritage - that of the Mughals. A day for Delhi sightseeing, which is conveniently accommodated in the tour, takes you to the red sandstone edifices, along with the British era and post-independence iconic structures that adorn the city’s historical profile. If you find this prelude absorbing, the detailed itinerary below would inspire you to embark on this amazing sojourn. The Rajasthan tour package 10 days itinerary begins with your arrival in the national capital Delhi. Our tour representative welcomes you at the airport/railway station and escorts you to the booked hotel. After some rest, you can begin the city sightseeing tour with us. Beginning as Indraprastha, the capital of Pandavas, Delhi has always been the stronghold of the powerful dynasties, be it the Tughlaqs, Lodis or Mughals. Having constantly served as a capital for thousands of years, the city buzzes with rich heritage and vivid culture that never fail to impress. Begin the sightseeing with a visit to Red Fort, the colossal red sandstone complex which is also a World Heritage Site. Get flattered by the lavish Mughal architecture revealing amazing ornamentation. After exploring the fort’s palaces and museums, head towards Humayun’s Tomb, another World Heritage Site and believed to be the precursor to Taj Mahal. The use of rubble masonry, white marble and red sandstone and spellbinding features like intricate lattice work of the monument has nothing to its parallel. Finally, visit the sprawling complex of Jama Masjid, another red sandstone and marble wonder known for its inlay details and calligraphies. Stay overnight at the hotel. Out of the Rajasthan tour package 10 days, spend another day exploring the spellbinding architectural heritage of Delhi. Start by visiting the iconic temples of Laxmi Narayan and Lotus Temple, the latter constructed in the shape of a lotus. Another wonderful attraction would be the World Heritage Site called Qutub Minar, considered the world’s tallest brick minaret. The Qutub Complex also features a number of tombs, mosques and the popular metallurgical wonder called Iron Pillar. Later, visit the astronomical observatory called Jantar Mantar, known for 13 architectural astronomical instruments. Other prime attractions of the day would include the war memorial India Gate, the resting place of Mahatma Gandhi called Raj Ghat and the British-made Parliament House, which is circular in shape inspired by the Ashoka Chakra. Be a spectator to the splendid Light and Sound Show at Red Fort, the one hour showcase of the city’s legendary past. As the third day of the Rajasthan tour package 10 days arrives, we transfer you to the Delhi Airport where you board the flight to Udaipur. Founded in 1559 by the Sisodia Rajputs, the city has lush green Aravallis flanking its borders while numerous lakes and lake palaces lend a surreal charm to it. It is sheer pleasure to wander through the narrow old lanes of Udaipur and discovering a lake every few footsteps. Then, there are beautiful temples, gardens, hilltop palaces and monuments that testify the valour and heroism as well as the artistic fervour of the Rajput rulers. One of the top wedding destinations, honeymoon places and heritage troves around the world, the city finds place in the travel bucket lists of tourists worldwide. On arrival, check in at the booked hotel for some rest. Afterwards, start the city sightseeing with a visit to more than 400 years old City Palace. Resting on the bank of Lake Pichola, the huge complex boasts of several palaces with marvellous mirror work, inlay work, murals and coloured glasses and other outstanding elements. After you spend several hours exploring the structures like Durbar Hall, Badi Mahal, Amar Vilas and Mor Chowk (Peacock Square), join us for a fascinating boat ride on the lake Pichola. The sunset views with hilltop palaces and verdant hills gazing back would leave you absolutely awestruck. Later, spend the night at the hotel. Spend another memorable day in Udaipur as we take you to see other glorious places of the city. Start with a holy visit to Jagdish Temple, an attention-grabbing structure with outstanding carvings. Saheliyon ki Bari, which was designed for the royal ladies and their maids, features beautiful lotus ponds, fountains and marble statues. Next, visit the royal mansion called Bagore ki Haveli which boasts of spectacular mirror work and embellishments. Some other popular attractions include Lok Kala Mandir Museum (fabulous collections and entertaining puppet shows), Monsoon Palace (located on a hilltop), Moti Magri (featuring a bronze statue of the brave Maharana Pratap and his famous horse Chetak) and lakes like Fateh Sagar and Doodh Talai. Depending on the time available, you visit these places before getting back to the hotel room. Leave Udaipur to reach Jodhpur, another intriguing architectural tale written on the desert canvas. Founded way back in 1459 as the capital of the Marwar Kingdom, the city dwells around the stupendous Mehrangarh Fort which sits on a unique geological feature called Malani Igenus Suite and seems to dominate the entire panorama. The city has always been a popular site for film shooting among directors from Bollywood and Hollywood. There are numerous lakes, gardens, palaces and monuments that make Jodhpur a prominent highlight of Rajasthan tourism. On Arrival, check in at the booked hotel and take some rest. Later, you can start the sightseeing tour with a visit to the colossal fort. Apart from the 7 huge gateways and several beautiful palaces, like Sheesh Mahal, Moti Mahal and Phool Mahal, the fort is also known for its fabulous museum galleries featuring howdahs, palanquins, turbans, paintings and armoury. The spellbinding views of the blue-painted houses below are a highlight of this place. Spend the rest of the time exploring the fort before retiring to your hotel room. 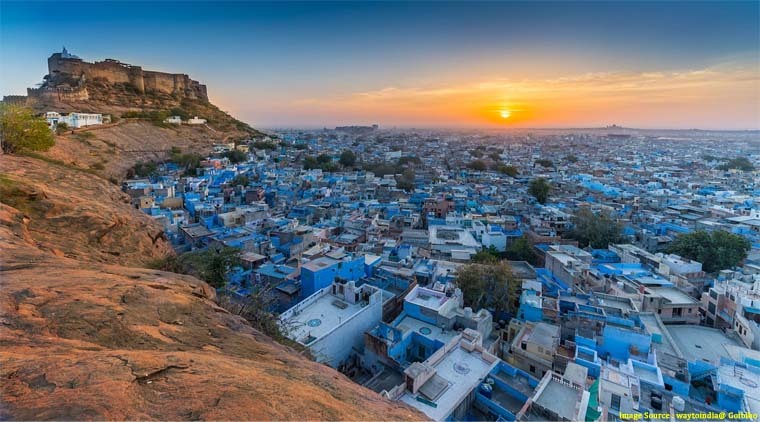 Get up early to visit other popular tourist places of Jodhpur. Jaswant Thada consists of royal cenotaphs made of thin and polished marble sheets which shine under the sun. The complex also features a small lake, a garden and gazebos. Later, visit the truly stunning Umaid Bhawan Palace, a part of which serves as a heritage hotel. 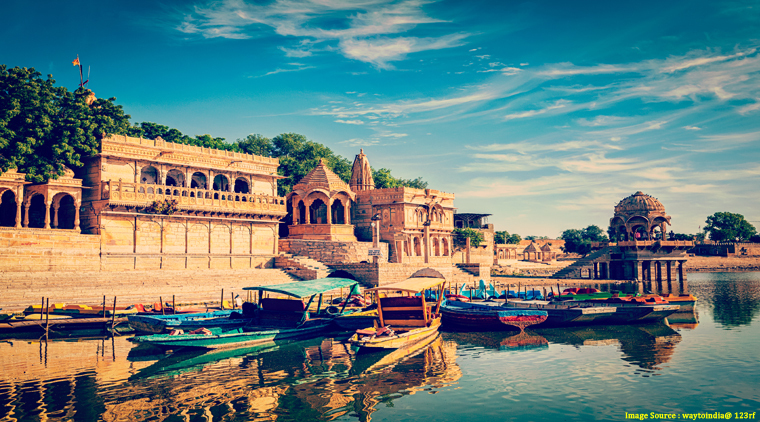 As the Rajasthan tour package of 10 days gets interesting, we invite you to join us on the road trip to Jaisalmer, the Golden City in the heart of Thar Desert. One of the oldest cities in Rajasthan, as it was established in 1156, Jaisalmer presents the true picture of desert life. Though, it never deviates from showcasing the breathtaking heritage wealth the state is known for. From the yellow sandstone edifices to the ornamental Jain temples and majestic merchant havelis, the place has enough charm to overwhelm one’s senses. On arrival, check in at the hotel and enjoy a comfortable night stay. Get excited waking up amidst the gold-laden architectural wonders and start the sightseeing tour with a visit to the grand Jaisalmer Fort. One of the world’s few living forts, the fort is popularly called the Golden Fort or Sonar Quilla for displaying different shades of gold throughout the day. Resting on Trikuta Hill, the fort is accessible from four massive gateways and remains busy because of numerous inhabitants, eateries and shops. Explore various palaces, temples, cannons and decorative elements as you wander through the centuries-old lanes, an experience that won’t fade away ever from your memory. Inside the fort complex, you would be enthralled to explore the intricately designed Jain Temples with the highest degree of artistic excellence. The excitement soars up as you come across the beautiful havelis (mansions) like Patwon Ji Ki Haveli, Nathmal Ji Ki Haveli and Salim Ji Ki Haveli, most of them flaunting the terrific fusion of Rajputana and Islamic architectures. 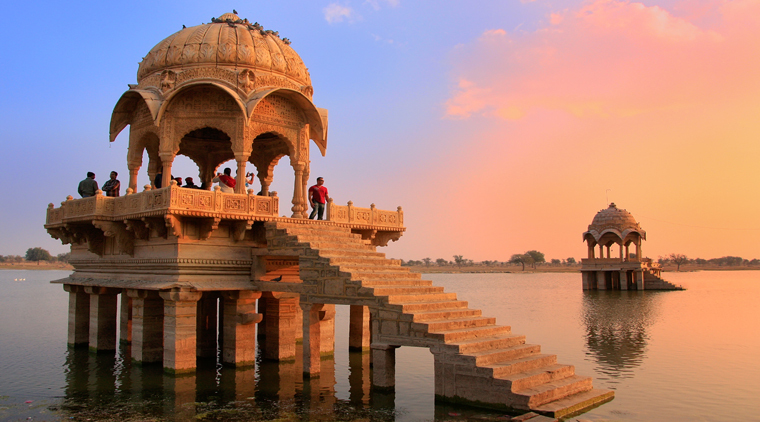 In the evening, get ready for one of the best sojourns of this Rajasthan tour package of 10 days. Join us to visit the Sam Sand Dunes. Here, you would not only enjoy the visual treat of dramatic sunset, but also have the pleasure of riding camels, the ships of the desert. Finally, return to the hotel for the night stay. As you bid adieu to Jaisalmer, we take you towards Gajner, the place famous for its lake, forts, palaces, camels and scrumptious snacks. The resplendent Gajner Palace was built as a hunting retreat for the royals. The opulent edifice rests as a silent spectator of the scenic Gajner Lake and is an architectural marvel. On arrival, check in at the booked hotel and go out to discover this amazing lakeside wonder. Later, we take you on an excursion to the city of Bikaner which came into being in the year 1488. The city is world-famous for Bikaneri bhujia and other snacks like kachori and samosa that surely are a treat to the taste buds. It is also home to one of the top-class camel breeds and there are research farms dedicated to camels as well as equines. 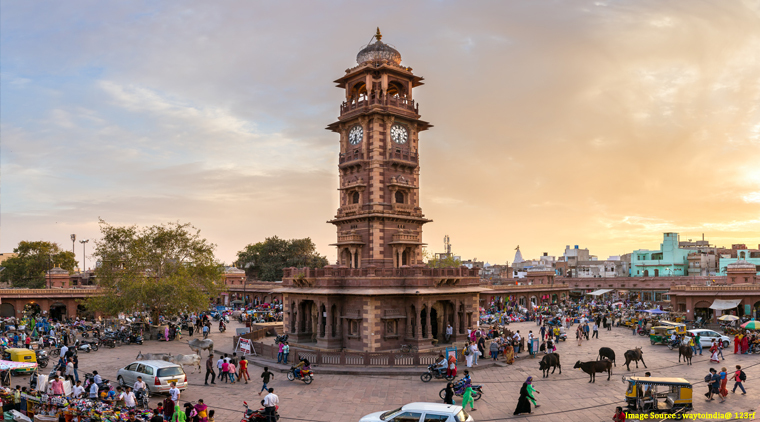 When it comes to heritage, Bikaner is no less than any other heritage city of Rajasthan as it boasts of the outstanding structures like Junagarh Fort and Laxmi Niwas Palace. Depending on the time available, you would be exploring some of the top attractions before getting back to the hotel in Gajner for night stay. The Rajasthan tour package 10 days itinerary is about to reach its conclusion as you start the journey to Mandawa. Believed to be founded in the 18th century, this fort town offers the perfect glimpse of the Shekhawati culture which boasts of stunningly painted havelis (mansions) as well as arrays of wells and cenotaphs. The owners of these mansions were the wealthy traders who settled on the town which had the advantage of being located on an old trade route. On arrival, check in at the booked hotel and relax for some time. Later, visit the 18th century Mandawa Fort which is known for its spellbinding frescos, carvings, mirror work and other adornments. From there, join us to explore some of the most famous havelis like Hanuman Prasad Goenka Haveli, Jhunjhunwala Haveli, Gulab Rai Ladia Haveli and Ram Pratap Nemani Haveli, each known for exquisite murals depicting various mythological and historical scenes. Start your journey back to Delhi and check in at the booked hotel on arrival. Later, you may choose to visit the tourist attractions that you were not able to explore earlier. You may also prefer to shop at some of the popular markets in Delhi, including Chandni Chowk, Paharganj Market, Sarojini Nagar Market, Khan Market, Lajpat Nagar Market, Dilli Haat etc. As the Rajasthan tour package of 10 days is about to end, we transfer you to the airport/railway station from where you can start your journey back to home. Make sure you remove shoes while visiting the tombs and cenotaphs. Many of the havelis at Mandawa are locked. However, you can admire the stunning frescos and murals from the outside. Havelis at Jaisalmer are home to bats. So, avoid visiting the dark corners. You would need to buy camera tickets (fees differ for still and video cameras). Also, photography is strictly prohibited at few sections of the historical places. Don’t be lured by the local residents posing as guides and demanding reasonable money. Be careful if you decide to consume bhang lassi in Jodhpur as it may have an intoxicating effect on you. Never ever during the Rajasthan tour package of 10 days accept anything to eat or drink from strangers. Make sure you get back to the hotel room before it gets dark when you are in Rajasthan.